It was an excruciating toothache that Sushila Ramdas Ahire had never experienced before. It started six months ago and has had repercussions the 62-year-old could never have imagined: she has been out of work and despite several knocks on the doors of local authorities, her efforts have been futile. “It was just that one day that I decided not to pick up the broom, to take some rest. And now I’m scrambling to run the house,” said the Ahire, showing me her documents as proof she had been employed. Ahire is a sweeper, cleaning a 1.5 km stretch in different parts of S-ward – an administrative area in northeast Mumbai. For the last 15 years, she has worked on a contract basis running in seven month intervals. When her contract was up, she would get hired by a new contractor. Six months ago, the day she took a day off, her contractor had changed. When she went to work the next day, she found herself jobless. “I have been cleaning the streets of S-ward for so many years. I was also given the orange jacket which is given to the sanitation workers like us, so that proves that I am entitled to a job. But nobody is ready to listen to me. They say I’m too old to work. But neither have they given me any pension,” she says from her tiny home. Ahire is a Dalit. Once considered untouchables, Dalit refers to those belonging to India’s lowest caste system. They were called untouchables because of the ‘dirty’ work they were connected with. They have lived in segregation and exclusion along with a history of discrimination. Dalits continue to face the brunt of violence across India. According to the National Campaign on Dalit Human Rights, a survey conducted in 565 villages across 11 major states in India reveals that discriminatory – and often criminal – practices against Dalits persist. The study states that in at least 140 villages, Dalits are paid lower wages than other workers: “They were also subjected to much longer working hours, delayed wages, verbal and even physical abuse,” the report states. Ahire would agree to these statistics if she could read and write. She was married at an early age to a man who already had another wife and children. Now, between both wives, there are two sons and six daughters. When the children were still young, they all lived together in the same 10’ x 10’ square metres house made only of tarpaulin sheets and with no electricity. Today, the house has been fortified with bricks, and an upper mezzanine floor has been erected to double up living space. Behind her small house is a sprawling gated housing complex that is home to some of the city’s wealthiest residents. 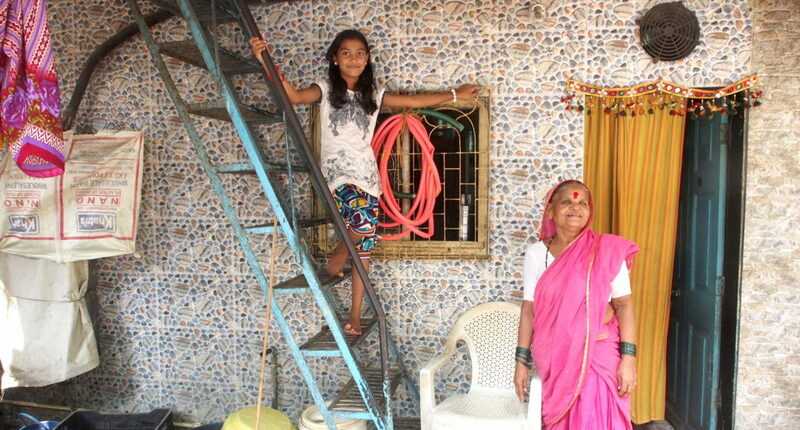 Until about 2015, there was no direct water line to her home. Ahire says that they were lucky that the public tap was just around the corner; for others, it was a long walk. From noon to 4 pm everyday, water would be available, and the entire community of low-income residents like Ahire would gather by the tap. While Ahire was at work, her son Nilesh would return home from school to fill water buckets with his older brother’s wife and his step-mother, bring them home, and then fill some more. “When could he study when every extra pair of hands would be necessary to fill up water?” asks Ahire rhetorically. Nilesh did not clear his matriculation exam and instead began to look for odd jobs. Today, even though all daughters except one have been married, and with the addition of two grandchildren, the nine members of the family are beset with worries about Ahire’s loss of employment. The Municipal Corporation of Greater Mumbai (MCGM) outsources work to a large number of contractors who hire people like Ahire. According to India’s Contract Labour Act of 1970, rights have been enshrined for workers in establishments with more than 20 workers. The contractors hire fewer than 20 people, thus retaining the upper hand with the workers and getting away with not issuing them any provident fund or employee’s state insurance. Workers are told they will receive these funds to their bank account but are never issued the necessary receipts. In the recent past, sanitation workers like Ahire were not given any gloves or masks to protect themselves. Years of activism and campaigning brought to light the inhuman condition of workers. Today, organisations like Kachra Vahtuk Shramik Sangh (KVSS or Collective of Sanitation Workers), represent people like Ahire in matters pertaining to their rights as workers. Of course, MCGM’s workers have their own unions but their support comes from various political parties with questionable intentions aimed at seeking the votes of the workers. There are only few organisations like KVSS that unionise contract workers like Ahire. There are 28,500 workers employed by the Solid Waste Management Department of the MCGM and about 10,000 workers like Ahire who are on contract labour. KVSS has 1,200 members and has been engaging with the law to ensure permanent worker status to contract workers like Ahire, and thereby ensure that they receive similar wages like those of the permanent workers. When she started the work as a sweeper in 2002, Ahire was paid a daily wage of 50 rupees (roughly 1 euro at the time) for eight hours of work, which included one hour for a lunch break. 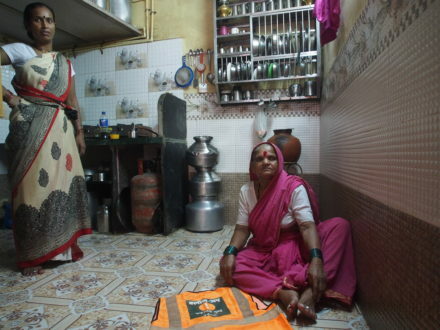 Until six months ago, when she had her job, that daily wage had been increased to 350 rupees (4.60 euros). However, there’s a huge gap between what people like her are paid and what permanent workers with MCGM are paid for the same work. Compared to Ahire’s 9,100 rupees for 26 days of work, a worker directly employed by MCGM would get anywhere between 25,000 to 28,000 rupees depending on the worker’s date of joining. Earlier this year, KVSS won a decade-long legal battle, whereby the Supreme Court of India confirmed the ‘permanent’ job status of 2,700 workers that KVSS was representing. Ahire was one of those who job status was confirmed. There was the promise of workers receiving their arrears soon and that if they had to approach their nearest ward office, their concerns would be treated with utmost priority. But none of the 2,700 workers have received any of the promised benefits or arrears or updated wages. “Our daughter works as a househelp. My younger son Nilesh has a job at a library. They had earlier promised that my older son could take up my job, as that’s the norm. They said I am too old. But neither are they hiring my son,” says an exasperated Ahire, stating that a monthly income of 12,000 rupees – from the earnings of the two children – is just not enough to run the household. The other biggest concern for the disadvantaged in India are medical expenses. A 2012 report reveals that 80 per cent of medical costs are paid out-of-pocket and healthcare debts plunge 40 million Indians into poverty every year. Few years ago, Ahire had been assigned to sweep the streets of a busy highway, not far from her home. The highway, prone to traffic snarls, is also notorious for accidents during monsoons. One day, Ahire was struck by a speeding vehicle and she suffered a deep gash on her left leg below the knee. The driver of the vehicle gave her some money and took her to a nearby public hospital where she was treated. Ahire was in pain but she was back at work after just two days. “What’s the point of sitting at home and resting? It only means a loss of a day’s wage,” she says. Her employment with the contractor does not provide any medical insurance and her accident, while on the job, became her own liability. “What other option do we have?” asks Nilesh, even though he asserts that he would never go down inside a drain. “Look, it is just livelihood for us. Babasaheb Ambedkar had taught us that there is dignity in any work,” Ahire tries to explain. 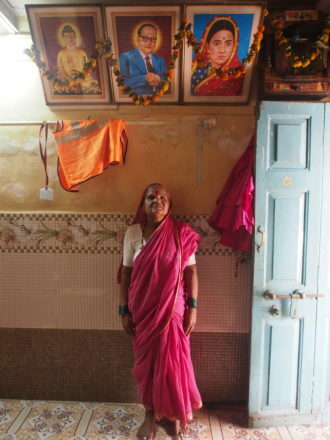 A large portrait of Dr Bhimrao Ambedkar hangs on the wall inside her house, like in the house of almost every Dalit household. Dr Ambedkar was a Dalit who, despite the discrimination he endured in his youth, educated himself, became a barrister, worked along with MK Gandhi towards freeing India from the British rule while continuing to question caste discrimination in India. After India was born as a free country in 1947, Dr Ambedkar wrote the Constitution of India. Caste-based reservations – or affirmative action – have been prevalent in various educational institutions and government jobs in India toward favouring disadvantaged groups like Dalits. Ahire is glad to be resting at home but misses working with her younger colleagues and the promise of wages that could lead to a relatively comfortable life. She participates in the annual gatherings for the birth and death anniversaries of Dr Ambedkar. Scores of men and women who keep the city clean also attend. With her KVSS membership card, she has previously attended protest meetings that aim to improve workers’ lives and demand better wages. 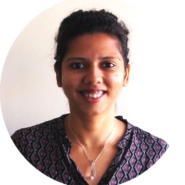 Priyanka Borpujari (32) has been a journalist for a decade and has reported from across India, as well as El Salvador and Indonesia. She has won numerous awards and fellowships for her journalism; she was the 2015 Indien-Deutschland Medienbotschafter and was a guest journalist at German weekly newspaper DIE ZEIT. She is also a contributing columnist for The Diplomat.